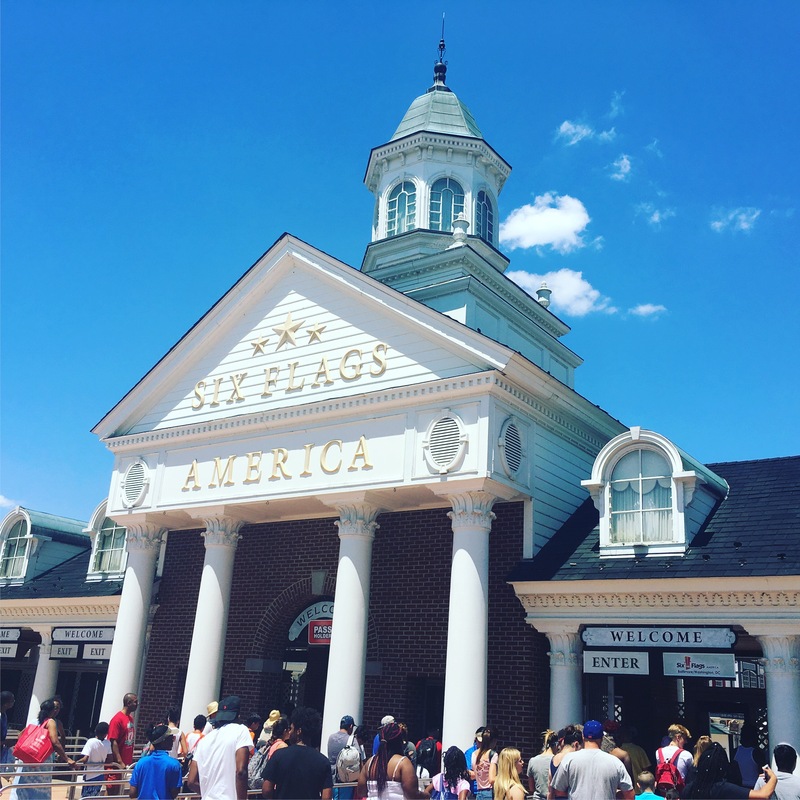 On Sunday, July 9th, I paid my first visit to Six Flags America in Bowie, MD. 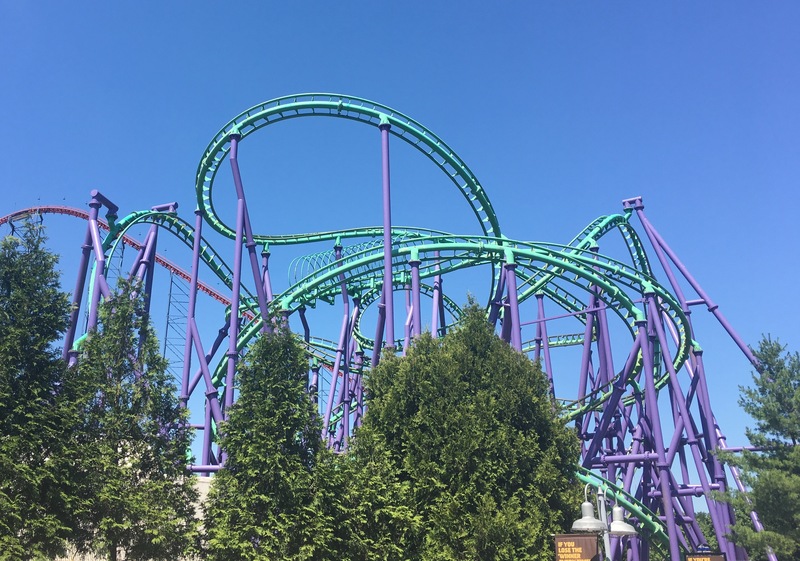 Although I was coming down with a bad cold, I still managed to have a pretty good time at the park, and rode 6 of their 9 coasters before I couldn’t do any more due to feeling pretty out of it. Also, at the time of writing this report, I am still getting over this stupid cold. So please excuse any grammatical or spelling errors I might have made. Sorry in advance! It’s like we’re in a pseudo-Six Flags New England! My dad, brother, and I arrived at the park at 11 am, about a half hour after opening time. The parking lot was pretty packed, so we were a bit worried that crowds would be bad. Luckily, it seemed everyone was in Hurricane Harbor, and the rest of the park was almost deserted. 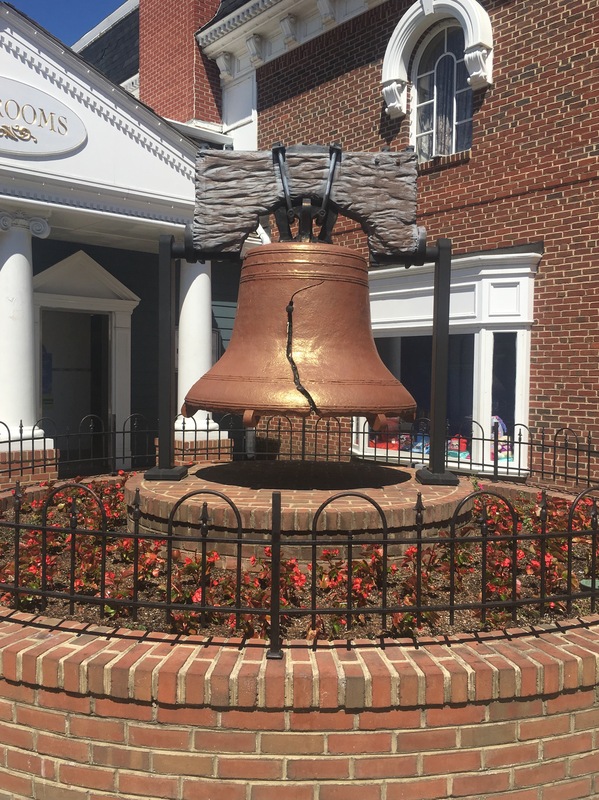 The park had a fake Liberty Bell in the entrance plaza…so that’s pretty cool. We all wanted to ride Joker’s Jinx first, but the ride broke down right as we walked into the station. 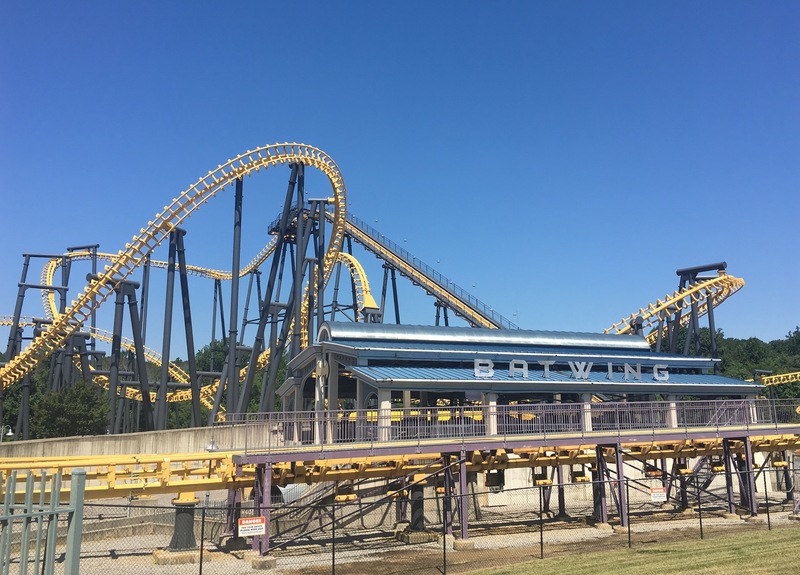 Instead, we walked all the way to the back of the park to ride Batwing, a Vekoma flying coaster. Overall, I was really impressed with Batwing. Sure the restraints weren’t the best, and it was a bit rough, but the layout was very fun! I also really enjoyed being flipped over into the flying position at the top of the lift, as it differed from the other B&M flyers that I’ve ridden. 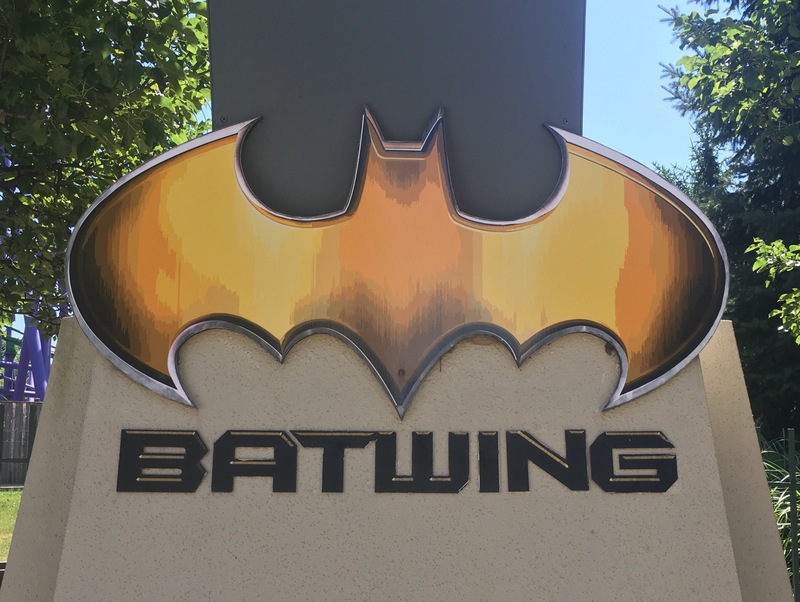 I’d also rank Batwing as my second favorite flying coaster, placing ahead of Superman: Ultimate Flight, but just behind Tatsu at Magic Mountain. At least it’s not called Batman: The Ride, right? Next up was Superman: Ride of Steel. I wasn’t expecting too much from this ride, as some enthusiasts say it’s boring. Luckily, Superman somewhat managed to impress me. 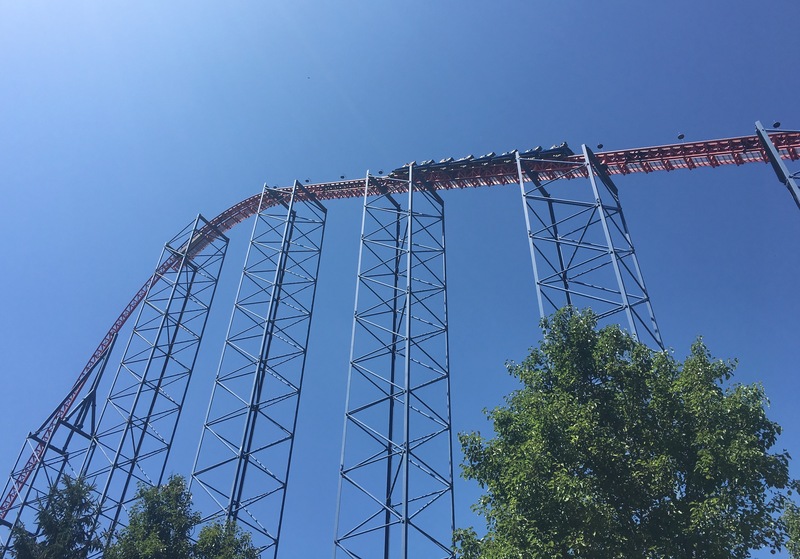 The first drop was actually one of the most forceful drops I’ve ever been on, and it had some pretty impressive airtime. 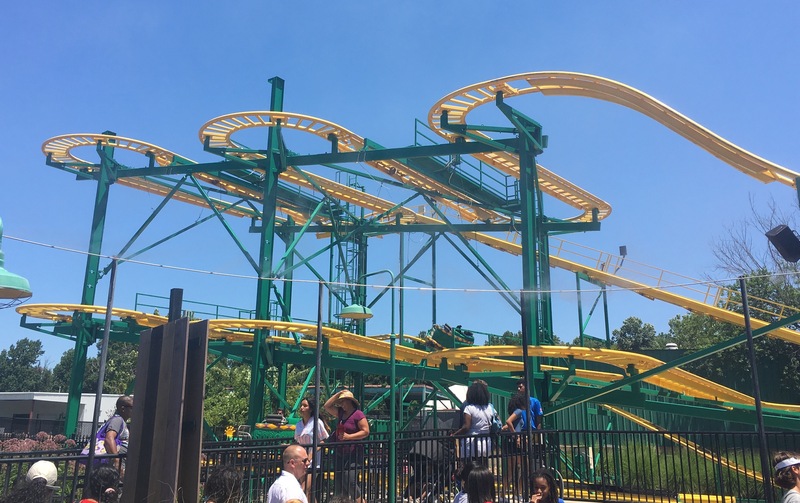 Sure, the helices were bland and not as intense as they should’ve been, but that didn’t keep it from being an overall good ride. That said, I do think it takes the spot for the weakest hyper coaster I’ve ridden. Either this or Raging Bull. Again, it’s like we’re in pseudo-Six Flags New England! By now, Joker’s Jinx had opened back up, so we walked back to ride it. To be honest, it was kind of underwhelming. For those who don’t know, I’m a huge fan of launch coasters, so I was expecting this to be my favorite ride at the park. Sadly, the launch was pretty forceless, as was the rest of the ride. I guess the inversions were kind of fun, but overall it was pretty mediocre. One thing Joker did really good was all of it’s head chopper elements. We were constantly ducking under the many supports and track in fear of getting decapitated! We finished up in the DC Comics area, and the headed to our next coaster: Apocalypse. This coaster actually held a special place in my Dad’s heart, as he rode it back when it was known as Iron Wolf at Six Flags Great America. It was definitely his most anticipated coaster at the park, and loved getting back on it after all these years. As for me, I realized that stand-up coasters aren’t nearly as bad as everyone claims them to be. 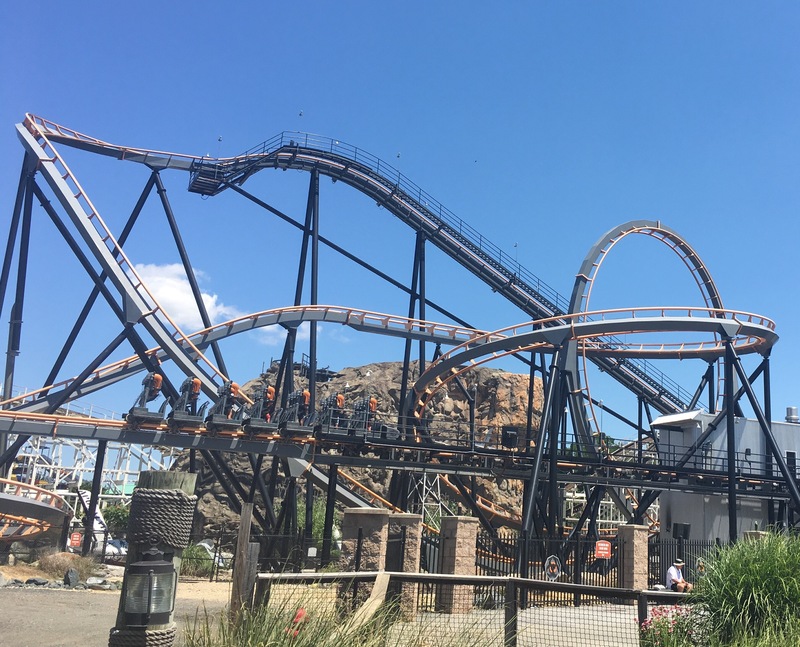 I had missed out on Riddler’s Revenge at Magic Mountain (it was closed), so Apocalypse was my first coaster of its kind. Sure, the restraints were incredibly uncomfortable, but I actually found standing on a coaster to be pretty fun! Riding in the front row provides a different perspective of the track you are riding on, much like riding in the front of an invert does. The layout was actually pretty cool too, and it was a much longer ride than I expected. Apocalypse gets a thumbs up in my book. 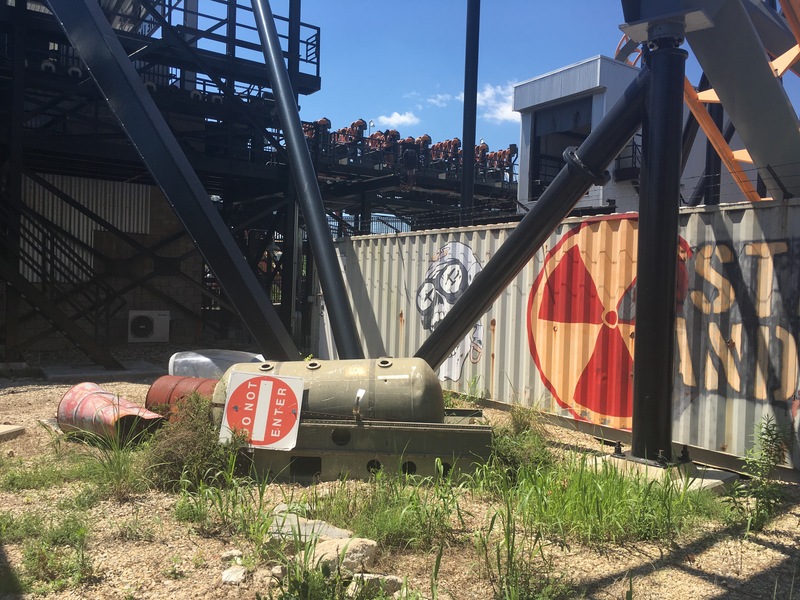 A pile of junk…this is Six Flags theming at its best I guess. You know what doesn’t get a thumbs up though? 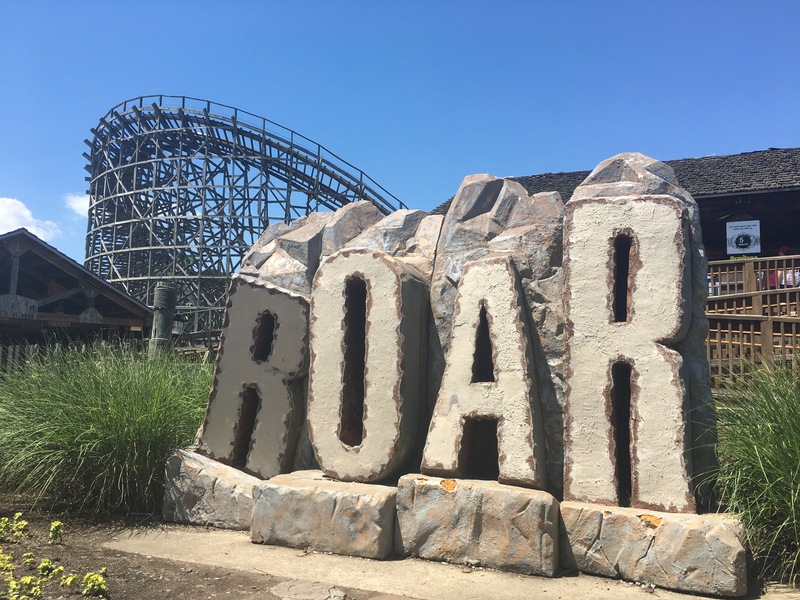 Roar, the parks GCI wooden coaster. I didn’t really know what to expect going into Roar, but I came out unsatisfied…and with a pain in my shoulder. It was a really bumpy, uncomfortable ride. There was little to no airtime, and the banked turns were far too rough to be enjoyed. But hey, at least the entrance sign was pretty cool. It’s like a smaller, knockoff Goliath sign from Magic Mountain! After Roar, we had to temporarily exit the park to grab more cold medicine from our car. That took a while, and then we had to get some drinks from one of the quick service stands. Service wasn’t the best there, so we were waiting a good 20 minutes. We got our drinks, and sat down to take a break. I think the Super-Loop actually had the longest wait in the entire park…which was like 20 min. Sadly, the medicine didn’t kick in like it did earlier this morning, so I was feeling pretty crappy the rest of the day. We walked over to ride Wild One, but they weren’t letting anybody on the ride due to it being stuck on the lift hill. Instead, we got in line for Ragin Cajun, but I decided to bail last minute. I’m not too bummed I missed that credit though, since it was basically just a spinning wild mouse. 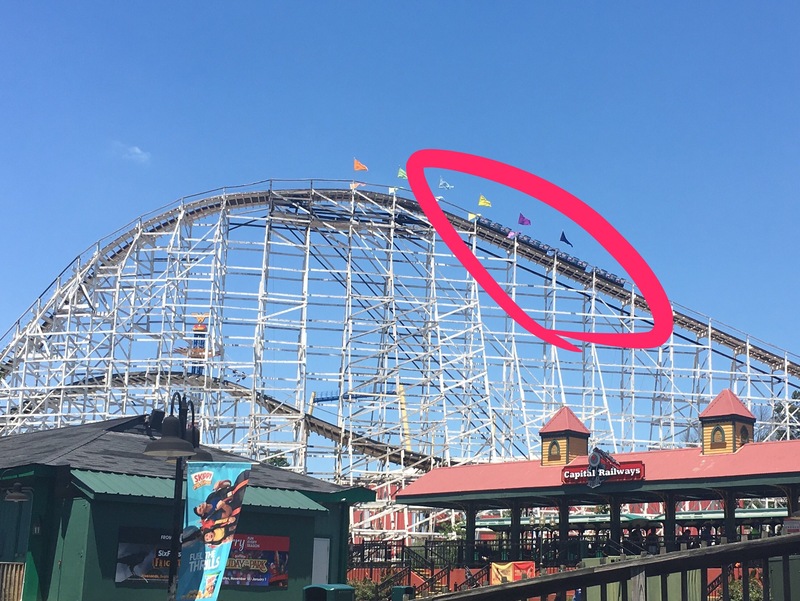 Don’t worry kids, the 100 year old coaster that got stuck on the lift hill is totally safe and reliable! Ragin Cajun: Another hand-me-down from Great America. It was looking like I wasn’t going to be up for riding anything else during the day. We were about to exit the park, but then saw that Wild One had opened back up. I basically forced myself to ride it despite feeling sick, and it was actually really worth it! 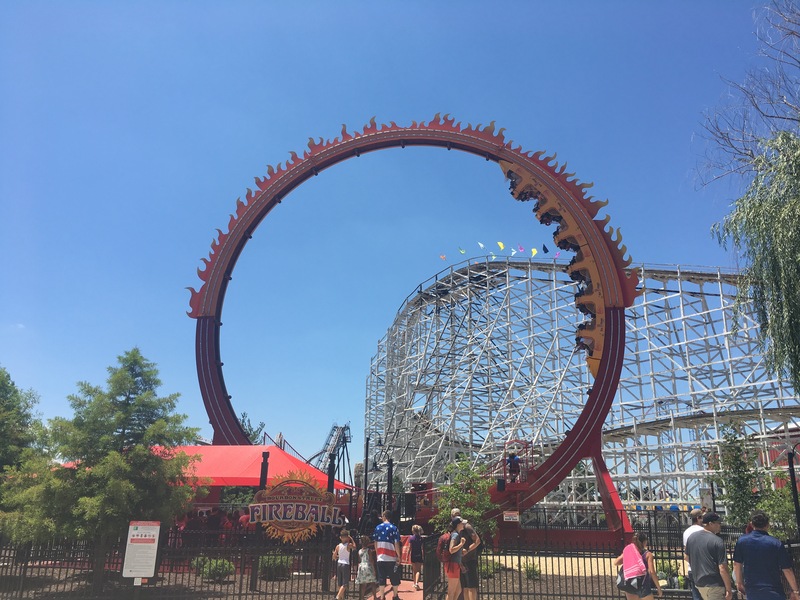 Wild One was a super fun ride, and was surprisingly smooth for a 100 year old coaster. I’m glad I decided to ride it, and hope to ride it again someday when I’m not feeling completely out of it. That pretty much concluded our day at Six Flags America. I went in the Flags store to buy a mug to commemorate the trip, and then we left the park. Overall it was a pretty good day, despite having a cold. That said, I don’t think I’ll ever visit a theme park again while I’m sick. It definitely takes a lot of the enjoyment out of riding coasters. Hopefully I’ll visit Six Flags America again, so I can get a better read on everything else the park has to offer. Want to stay up to date with our latest theme park plans, trip reports, reviews, and more? Be sure to follow us on here, Twitter @ack1918 and @limitless_park, and Instagram @Limitless_Park!